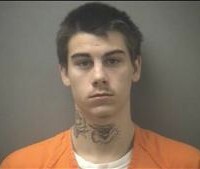 LUDINGTON — A pre-trial conference for Marshall Jennings Brault, 19, has been adjourned until May 7. Brault, 606 N. Gaylord Ave., was arraigned in Mason County on arson charges earlier this year. He and Travis Malone allegedly committed both the arson and the breaking and entering. Both are charged for the Oct. 17, 2012 arson of the house located at the corner of Court and William streets. Brault and Malone were also charged in Oceana County for the Oct. 21, 2012 breaking and entering of the Wishing Well convenience store. Mason County Prosecutor Paul Spaniola said he met with Brault’s lawyer today and they are discussing a plea arrangement. Brault’s bail in Mason County was also set at $50,000. He is lodged in the Mason County jail.